"2/28" redirects here. For the battalion of the United States Marine Corps, see 2nd Battalion 28th Marines. For the date, see February 28. Not to be confused with February 26 Incident. In 1945, following the surrender of Japan at the end of World War II, the Allies handed administrative control of Taiwan to the Republic of China (ROC), thus ending 50 years of Japanese colonial rule. Local inhabitants became resentful of what they saw as high-handed and frequently corrupt conduct on the part of the Kuomintang (KMT) authorities, including arbitrary seizure of private property and their economic mismanagement. The flashpoint came on February 27, 1947 in Taipei, when KMT investigators suspected a Taiwanese widow of selling contraband cigarettes, and beat her. The crowd was in uproar, and the investigator shot into the crowd, killing a man. The violence spread, and people on both side of the conflict were accused of indiscriminate killings. The uprising was violently put down by the National Revolutionary Army, and the island was placed under martial law. The incident is literally called the "two-two-eight incident" in Chinese, which name derives from the "year-month-day" date format convention used for dates in Chinese. Chinese languages do not have common names for the months, so months are given as numbers and dates are given in the form "a-b-c-d year, x month, y day" (Chinese: abcd年x月yy日; literally: 'a-b-c-d year, x month, yy day') with all numbers being read out as cardinals without any leading zeroes. With the massacre dated on February 28, 1947, the name is rendered "one nine four seven year, two month, two [tens] eight day". For brevity, just the numbers are given, and, as a date of significance, the day and month without the year suffices as the name. [note 1] Other historical events named using the same conventions as the "two-two-eight incident" include the May Fourth Movement (May 4, 1919) the "Five-Four Movement", the Tiananmen Incident (April 5, 1976) the "four-five movement" and the Tianamen Square massacre/protests (June 4, 1989) the "six-four incident". During the 50 years of Japanese rule in Taiwan (1895–1945), Japan developed Taiwan's economy and raised the standard of living for most Taiwanese people, building up Taiwan as a supply base for the Japanese main islands. Consequently, Taiwanese perceptions of the Japanese rule were more favourable than perceptions in other parts of East and Southeast Asia. Taiwanese adopted Japanese names and practiced Shinto, while the schools instilled a sense of "Japanese spirit" in students. By the time World War II began, many Taiwanese were proficient in the Japanese language. Severe inflation led the Bank of Taiwan to issue of bearer's checks in denominations of 1 million Taiwan Dollars (TW$1,000,000) in 1949. After World War II, Taiwan was placed under the administrative control of the Republic of China to provide stability until a permanent arrangement could be made. Chen Yi, the Governor-General of Taiwan, arrived on October 24, 1945, and received the last Japanese governor, Ando Rikichi, who signed the document of surrender on the next day. Chen Yi then proclaimed the day as Retrocession Day to make Taiwan part of the Republic of China, although there were questions about the legality of doing so. The Kuomintang (KMT) troops from Mainland China were initially welcomed by local inhabitants, but their harsh behaviour and the KMT maladministration led to Taiwanese discontent during the immediate postwar period. As Governor-General, Chen Yi took over and sustained the Japanese system of state monopolies in tobacco, sugar, camphor, tea, paper, chemicals, petroleum refining, mining and cement, just the way the Nationalists treated people in other former Japanese-controlled areas (people nicknamed him robber "劫收"). He confiscated some 500 Japanese-owned factories and mines, and homes of former Japanese residents. Economic mismanagement led to a large black market, runaway inflation and food shortages. Many commodities were compulsorily bought cheaply by the KMT administration and shipped to Mainland China to meet the Civil War shortages where they were sold at very high profit furthering the general shortage of goods in Taiwan. The price of rice rose to 100 times its original value between the time the Nationalists took over to the spring of 1946, increasing to nearly 4 times the price in Shanghai. It inflated further to 400 times the original price by January 1947. Carpetbaggers from Mainland China dominated nearly all industry, as well as political and judicial offices, displacing the Taiwanese who were formerly employed. Many of the ROC garrison troops were highly undisciplined, looting, stealing and contributing to the overall breakdown of infrastructure and public services. Because the Taiwanese elites had met with some success with self-government under Japanese rule, they had expected the same system from the incoming ruling Chinese Nationalist Government. However, the Chinese Nationalists opted for a different route, aiming for the centralization of government powers and a reduction in local authority. The KMT's nation-building efforts followed this ideology because of unpleasant experiences with the centrifugal forces during the Warlord Era in 1916–1928 that had torn the government in China. 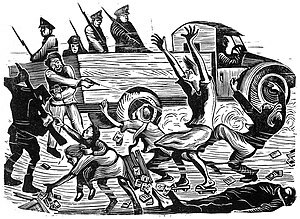 Mainland Communists were even preparing to bring down the government like the Ili Rebellion. The different goals of the Nationalists and the Taiwanese, coupled with cultural and language misunderstandings served to further inflame tensions on both sides. Today's 228 Memorial Museum in Taipei is housed in a broadcast station that played a role in the incident. On the evening of February 27, 1947, a Tobacco Monopoly Bureau enforcement team in Taipei went to the district of Taiheichō [zh] (太平町), Twatutia (present-day Nanjing West Road), where they confiscated contraband cigarettes from a 40-year-old widow named Lin Jiang-mai (林江邁) at the Tianma Tea House. When she demanded their return, one of the men holding a gun hit Lin's head with a pistol, prompting the surrounding Taiwanese crowd to challenge the Tobacco Monopoly agents. As they fled, one agent shot his gun into the crowd, killing one bystander. The crowd, which had already been harboring many feelings of frustration from unemployment, inflation and corruption of the Nationalist government, reached its breaking point. The crowd protested to both the police and the gendarmes, but was mostly ignored. Violence flared the following morning on February 28. Security forces at the Governor-General's Office tried to disperse the crowd. Some fired on the protesters who were calling for the arrest and trial of the agents involved in the previous day's shooting, resulting in several deaths. Formosans took over the administration of the town and military bases on March 4 and forced their way into local radio station to protest. By evening, martial law had been declared and curfews were enforced by the arrest or shooting of anyone who violated curfew. For several weeks after the February 28 incident, the Taiwanese civilians controlled much of Taiwan. The initial riots were spontaneous and somewhat violent. Within a few days the Taiwanese were generally coordinated and organized, and public order in Taiwanese-held areas was upheld by volunteer civilians organized by students, and unemployed former Japanese army soldiers. Local leaders formed a Settlement Committee, which presented the government with a list of 32 Demands for reform of the provincial administration. They demanded, among other things, greater autonomy, free elections, surrender of the ROC Army to the Settlement Committee, and an end to governmental corruption. Motivations among the various Taiwanese groups varied; some demanded greater autonomy within the ROC, while others wanted UN trusteeship or full independence. The Taiwanese also demanded representation in the forthcoming peace treaty negotiations with Japan, hoping to secure a plebiscite to determine the island's political future. Outside of Taipei, it was less peaceful. Mainland Chinese received revenge attacks of violence. Public places like banks and post offices were looted. Some had to flee for Military Police protection. A few smaller groups formed, including the Communist-inspired "27 Brigade". They looted 3 machine guns, 300 rifles, and hand grenades from military arsenals in Taichung and Pingtung. The armed Taiwanese shot or injured around 200 Nationalist Army soldiers which quickly precipitated the house arrest or execution of those who participated in the rebellion. The Nationalist Government, under Chen Yi, stalled for time while it reassembled the retreating ROC armies when the armies' reached Fujian. Upon its arrival on March 8, the ROC troops launched a crackdown. The New York Times reported, "An American who had just arrived in China from Taihoku said that troops from the mainland China arrived there on March 7 and indulged in three days of indiscriminate killing and looting. For a time everyone seen on the streets was shot at, homes were broken into and occupants killed. In the poorer sections the streets were said to have been littered with dead. There were instances of beheadings and mutilation of bodies, and women were raped, the American said." By the end of March, Chen Yi had ordered the imprisonment or execution of the leading Taiwanese organizers he could identify. 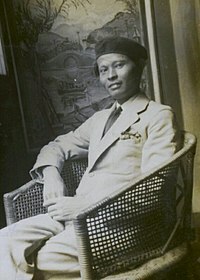 His troops reportedly executed, according to a Taiwanese delegation in Nanjing, between 3,000 and 4,000 people throughout the island. The exact number is still undetermined, as only 300 Taiwanese families applied for another compensation as recently as 1990. Detailed records kept by the KMT have been reported as "lost". Some of the killings were random, while others were systematic. Taiwanese elites were among those targeted, and many of the Taiwanese who had formed self-governing groups during the reign of the Japanese were also victims of the 228 incident. A disproportionate number of the victims were Taiwanese high school students. Many had recently served in the Imperial Japanese Army, having volunteered to serve to maintain order. Mainland Chinese civilians who fled were often beaten by Taiwanese. Some Taiwan political organizations participated in the uprising, for example Taiwan Democratic Self-Government League, was announced "communist" and illegal. Many members were arrested and executed. Some of these organizations had to move to Hong Kong. The initial 228 purge was followed by discovery of communist infiltrators from communist mainland China under one-party rule, in what was termed "White Terror," which lasted until the end of 1987. Thousands of people, including both mainland Chinese and Taiwanese, were imprisoned or executed for their dissent, leaving the Taiwanese with a deep-seated bitterness towards what they term the Nationalist regime and, by extension, all Chinese not born in Taiwan or anyone supporting the KMT or CCP. Disappearances were common, and the people feared being be captured and executed. For several decades, it was taboo to openly criticize the 228 massacre incident. The government hoped that the execution of Governor Chen Yi and financial compensation for the victims had quelled resentment. In the 1970s the 228 Justice and Peace Movement was initiated by several citizens' groups to ask for a reversal of this policy, and, in 1992, the Executive Yuan promulgated the "February 28 Incident Research Report." Then-President and KMT-chairman Lee Teng-hui, who had participated in the incident and was arrested as an instigator and a Communist sympathizer made a formal apology on behalf of the government in 1995 and declared February 28 a day to commemorate the victims. Among other memorials erected, Taipei New Park was renamed 228 Memorial Park. Since the lifting of martial law in 1987, the government has set up the 228 Incident Memorial Foundation, a civilian reparations fund supported by public donations for the victims and their families. Many descendants of victims remain unaware that their family members were victims, while many of the families of victims from Mainland China did not know the details of their relatives' mistreatment during the riot. Those who have received compensation more than two times are demanding trials of the still-living soldiers and officials who were responsible for the summary executions and deaths of their loved ones. Prior to the 228 massacre, many Taiwanese hoped for a greater autonomy from China. 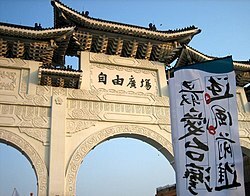 The failure of conclusive dialogue with the ROC administration in early March, combined with the feelings of betrayal felt towards the government and China in general are widely believed to have catalyzed today's Taiwan independence movement and subsequently the Taiwan Name Rectification Campaign after democratization. On February 28, 2004, thousands of Taiwanese participated in the 228 Hand-in-Hand Rally. They formed a 500-kilometer (310 mi) long human chain, from Taiwan's northernmost city to its southern tip, to commemorate the 228 incident, to call for peace, and to protest the People's Republic of China's deployment of missiles aimed at Taiwan along the coast of Taiwan Strait. In 2006, the Research Report on Responsibility for the 228 Massacre was released after several years of research. The 2006 report was not intended to overlap with the prior (1992) 228 Massacre Research Report commissioned by the Executive Yuan. Chiang Kai-shek is specifically named as bearing the largest responsibility in the 2006 report. However, some hardline academics have tried to confuse these conclusions, stating the departing Japanese colonial government was responsible by creating food shortages and causing inflation. A number of artists in Taiwan have addressed the subject of the 2–28 incident since the taboo was lifted on the subject in the early 1990s. The incident has been the subject of music by Fan-Long Ko and Tyzen Hsiao and a number of literary works. Hou Hsiao-hsien's A City of Sadness, the first movie dealing with the events, won the Golden Lion at the 1989 Venice Film Festival. The 2009 thriller Formosa Betrayed also relates the incident as part of the motivation behind Taiwan independence activist characters. Shawna Yang Ryan's novel, Green Island (2016) (Knopf) tells the story of the incident as it affects three generations of a Taiwanese family. 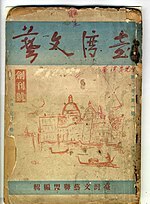 Julie Wu's novel, The Third Son (2013) (Algonquin) describes the event and its aftermath from the viewpoint of a Taiwanese boy. Jennifer Chow's novel, The 228 Legacy (2013) (Martin Sisters Publishing), brings to light the emotional ramifications for those who lived through the events yet suppressed their knowledge out of fear. It focuses on how there was such an impact that it permeated throughout multiple generations within the same family. In 2017, Taiwanese game developer Red Candle Games launched Detention, a survival horror video game created and developed for Steam. It is a 2D atmospheric horror side-scroller set in 1960s Taiwan under martial law following the 228 incident. The game also incorporates religious elements based on Taiwanese culture and mythology. The game has received favourable reviews from critics. Rely On Horror gave the game a 9 out of 10, saying that "every facet of Detention moves in one harmonious lockstep towards an unavoidable tragedy, drowning out the world around you." Taiwanese metal band Chthonic's album Mirror of Retribution also makes several lyrical references to the 228 massacre. ^ Compare "9/11" or "September 11th" to signify the September 11th attacks of 2001. ^ a b Forsythe, Michael (July 14, 2015). "Taiwan Turns Light on 1947 Slaughter by Chiang Kai-shek's Troops". New York Times. Archived from the original on April 24, 2006. Retrieved April 22, 2006. ^ Teon, Aris (February 27, 2017). "The 228 Incident – The Uprising that Changed Taiwan's History". The Greater China Journal. Retrieved March 23, 2019. ^ Ko, Shu-ling; Chang, Rich; Chao, Vincent Y. (March 1, 2011). "National 228 museum opens in Taipei". Taipei Times. p. 1. Retrieved November 14, 2014. ^ Chen, Ketty W. (February 28, 2013). 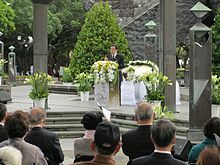 "Remembering Taiwan's Tragic Past". Taipei Times. p. 12. Retrieved November 14, 2014. ^ "Charter of the United Nations". Chapter XII: International Trusteeship System. United Nations. June 26, 1945. Archived from the original on August 28, 2010. Retrieved September 15, 2010. ^ "大「劫收」与上海民营工业". 檔案與史學. March 1, 1998. ^ "Formosa After the War". Reflection on the 228 Event—The first gunshot. 2003. Archived from the original on March 6, 2006. Retrieved March 6, 2006. ^ "The Taiwan province working committee organization of the CCP（1946~1950） in Taipei city". National Tamkang University. January 11, 2010. ^ "Seizing-cigarettes incident". Reflection on the 228 Event—The first gunshot. 2003. Archived from the original on March 6, 2006. Retrieved March 6, 2006. ^ Durdin, Peggy (May 24, 1947). "Terror in Taiwan". The Nation. Archived from the original on April 24, 2006. Retrieved April 22, 2006. ^ a b c d Smith, Craig A (2008). "Taiwan's 228 Incident and the Politics of Placing Blame". Past Imperfect. University of Alberta. 14: 143–163. ISSN 1711-053X. Retrieved November 13, 2014. ^ Durdin, Tillman (March 30, 1947). "Formosans' Plea For Red Aid Seen". New York Times. Archived from the original on February 15, 2006. Retrieved March 6, 2006. ^ "DPP questions former Premier Hau's 228 victim figures". The China Post. Taipei. February 29, 2012. Retrieved November 14, 2014. ^ * Wang, Xiaobo (February 2004). Taiwan Democratic Self-Government League and the February 28 Incident. Taipei: Straits Academic Press. ^ Kristof, Nicholas D. (April 3, 1992). "Taipei Journal; The Horror of 2–28: Taiwan Rips Open the Past". The New York Times. Retrieved November 20, 2014. ^ Mo, Yan-chih (February 28, 2006). "Remembering 228: Ghosts of the past are yet to be laid to rest". Taipei Times. p. 4. Retrieved November 14, 2014. ^ Chen, Yi-shen (February 2005). "Research Report on Responsibility for the 228 Massacre, Chapter II: Responsibility on the part of the decision-makers in Nanjing". 228.org.tw. The 228 Memorial Foundation. Archived from the original on February 28, 2015. Retrieved November 14, 2014. ^ Shih, Hsiu-chuan (February 28, 2007). "Hardline academics blame Japan for 228 Incident". Taipei Times. p. 1. Retrieved November 14, 2014. ^ "228 Massacre, 60th Commemoration". Retrieved March 12, 2017. ^ "A City of Sadness". October 21, 1989. Retrieved March 12, 2017 – via IMDb. ^ "Green Island by Shawna Yang Ryan - PenguinRandomHouse.com". Retrieved March 12, 2017. ^ Bloom, Dan (August 19, 2013). "US author probes 'legacy' of the 228 Incident in novel". Taipei Times. p. 3. Retrieved May 7, 2014. ^ "Review: Detention – Rely on Horror". Retrieved March 12, 2017. Kerr, George H. (1965). Formosa Betrayed. Boston: Houghton Mifflin. OL 5948105M. Lai, Tse-han; Myers, Ramon Hawley; Wei, Wou (1991). A Tragic Beginning: The Taiwan Uprising of February 28, 1947. Palo Alto: Stanford University Press. ISBN 9780804718295. Shackleton, Allan J. (1998) . Formosa Calling: An Eyewitness Account of Conditions in Taiwan during the February 28th, 1947 Incident. Upland, California: Taiwan Publishing Company. OCLC 419279752. Retrieved November 20, 2014. Wakabayashi, Masahiro (2003). "4: Overcoming the Difficult Past; Rectification of the 2–28 Incident and the Politics of Reconciliation in Taiwan". In Funabashi, Yōichi (ed.). Reconciliation in the Asia-Pacific. Washington, D.C.: United States Institute of Peace Press. pp. 91–109. ISBN 9781929223473. OCLC 51755853. Wikimedia Commons has media related to 228 Incident of Taiwan, 1947. 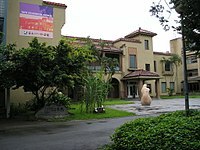 "Taipei 228 Memorial Museum (臺北228紀念館)". culture.tw. Taiwan Ministry of Culture. Archived from the original on November 29, 2014. Retrieved November 14, 2014. Hong, Keelung (February 28, 2003). My Search for 2–28 (Speech). Berkeley, California. Retrieved November 20, 2014. "The 228 Massacre, As Documented in the US Media". 2001. Archived from the original on June 25, 2007. Retrieved November 20, 2014. "Reflection on the 228 Event". Taiwan Human Rights InfoNet. 2003. Archived from the original on September 27, 2007. Retrieved November 20, 2014. Chu, Bevin (February 25, 2000). "Taiwan Independence and the 2–28 Incident". The Strait Scoop. Retrieved November 20, 2014. "Taiwan Yearbook 2006: The ROC on Taiwan — February 28 Incident". 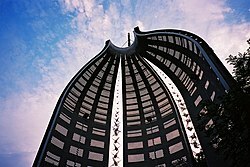 Taiwan Government Information Office. Archived from the original on August 1, 2007. Retrieved November 20, 2014. "Declaration of Formosan Civil Government 福爾摩沙平民政府宣言". 2009. Retrieved November 20, 2014. "Editorial: Historical record is key to justice". Taipei Times. February 28, 2007. p. 8. Retrieved November 20, 2014.